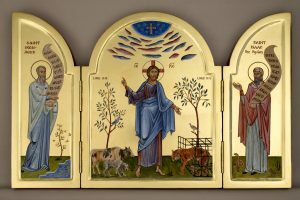 Pan-Orthodox Concern for Animals – Eastern Orthodox Christian concern for animal suffering. Our Mission is the advancement of Christian respect and responsibility for the animal creation with special reference to Eastern Orthodox teachings – ancient and modern, in order to reduce the suffering of animals. Our aim is to promote Christ’s loving compassionate care for all of His creatures and to advance the Patristic teachings that we as Image are to replicate Christ’s love and compassion for all of His created beings. We also aim to inform our readers that this subject has been discussed both in the Bible and by the early Church Fathers. It will also disseminate news/articles/interviews on compassionate care and relationships with animals from across the Orthodox world, together with articles and research on a wide range of contemporary animal issues. Current issues are engaged with on our Mini-Posts, Facebook and Twitter pages. We are registered as a charity with the Charity Commission number 1175072.